Middlesex University has been recognised for its contribution to workforce development at the Health Education North Central and East London (HENCEL) Quality Awards 2015. Middlesex University's School of Health and Education was named joint winner of the prize for 'Excellence in widening participation and wider workforce development' at the annual awards, an initiative by HENCEL, an organisation supporting healthcare provision and healthcare improvement in north central and east London. Middlesex was recognised for its work developing pathways for registration for health care support workers and overseas trained nurses who do not meet the requirements for registration in the UK. "There are hundreds of overseas trained nurses who are unable, for a variety of reasons, to register in the UK and are currently working as health care assistants (HCAs) in London," said Professor Kay Caldwell, Head of the Innovation Hub for Workforce Transformation at Middlesex, who led on the pathway project. "This represents a real waste of talent and experience at a time when registered nurses are in such demand with high vacancy rates across London. "We developed and are now delivering an Assistant Practitioner pathway to registration for HCAs, which is a two-year DipHE programme mapped to years one and two of our BSc Nursing programme. "This has been running in adult and mental health fields since September 2011 and students from the first cohort who progressed to the BSc Nursing have successfully completed the programme and have secured employment as staff nurses in their Trusts. "Year on year, the programme is growing in popularity with both HCAs and Trusts. "We are also delivering an Accreditation of Prior Learning (APL) pathway to registration for overseas trained nurses who are not eligible for Nursing and Midwifery Council registration and are working as HCAs. "Both of these pathways have been very successful in terms of student commitment and achievement, as well as demonstrating far lower attrition on the traditional BSc Nursing route, with students committed to remain working in their home Trust. "These viable and cost-effective pathways provide a career development route for local people who are currently working in support worker-level roles to become registered nurses, ensuring a supply of locally trained nurses to provide care to others in their community." The HENCEL award sees Middlesex receive a £10,000 educational bursary, which will be used to expand work on developing new routes to registration as a nurse. "This award is real recognition of the excellent work, led by Professor Caldwell, which many of our colleagues have been engaged in for some time in ensuring we offer Knowledge Exchange solutions to pressing local employer and national NHS needs," said Richard Beaumont, Deputy Dean, School of Health and Education. 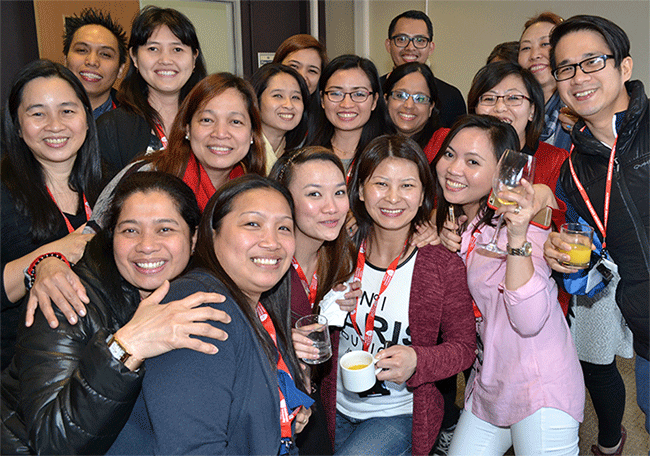 Image above: Students at the March 2015 launch of the new APL Route to NMC Nurse Registration for Overseas Trained Nurses Pilot Project.